This is the ColorNews theme instruction page. We have tried our best to keep it as simple as possible. If you think it can be made even simpler let us know we will be glad to change it. Let’s start! On the right side you can see the table of contents of this documentation. Jump to the section you want, or read it all through – your choice. Let’s move on! Installing your theme is pretty easy! After downloading you should have a colornews.zip file. This is a compressed file containing all of the required templates and images required for the theme to function properly. All of the options related to the Header part in this theme is available through Appearance > Customize > Header Options. From this setting in this theme, you can place the header image uploaded in your site in any place as required, which is described in this theme. You need to check on the checkbox saying ‘Check to show the home icon in the primary menu‘, and then, click on Save & Publish button to save the changes. Info: Have create Custom menu for Category and Social menu. You need to check on the checkbox saying ‘Check to show the date in header‘, and then, click on Save & Publish button to save the changes. You need to check on the checkbox saying ‘Check to display the Search Icon in the primary menu‘, and then, click on Save & Publish button to save the changes. You need to check on the checkbox saying ‘Check to enable the breaking news section‘, and then, click on Save & Publish button to save the changes. You need to check on the checkbox saying ‘Check to enable the sticky behavior of the primary menu‘, and then, click on Save & Publish button to save the changes. You now can add any text for this, ie, change the Latest: word to anything you want. For this, you have to change the text under the Enter the text to display for the ticker news to apply. It also has the option of the fading time to be set up for this, which is just under the Enter the fading time for the Breaking News in the Header label. Here, you need to enter the number as your requirement. Note: only enter the number here and it will be converted in seconds. It also has the option of the duration time to be set up for this, which is just under the Enter the duration time for the Breaking News in the Header label. Here, you need to enter the number as your requirement. Note: only enter the number here and it will be converted in seconds. After you made the required changes, click on Save & Publish button to save the changes. Now choose the required layout option from here to be used in your site. Note: This layout option will have effect on the archive, blog as well as search pages. Also, it will take effect on the post and pages too, if you have not set any of the layout option for this theme via the other layout option, provided through the Customize Options and Select Layout option via the post editor section. Note: This layout is for the pages only, which will overwrite the default layout. It can again be overwritten individually through the post editor section. 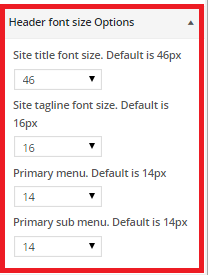 So, if the page does not have selected any layout for it, via the post editor section, in Select Layout option, it will take effect in your site. Note: This layout is for the posts only, which will overwrite the default layout. It can again be overwritten individually through the post editor section. 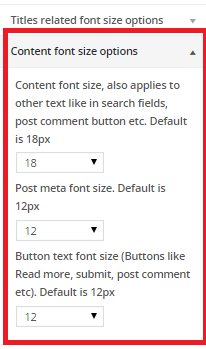 So, if the post does not have selected any layout for it, via the post editor section, in Select Layout option, it will take effect in your site. Now, choose the required primary color for your site. Now, choose the required background color for your site there. From your WordPress dashboard, go to Appearance > Customize section. Now, click on the Typography Options section. Now, click on the Color Options section. Header Color Options: This section covers all the color settings, which cover the header area. Content part color options: This section covers all the color settings, which cover content area. Footer part color options: This section covers all the color settings, which covers the footer area. After you have chosen all of the required color options for your site here, you can now click on Save & Publish button to save the changes in your site. Click on the Additional Options > Featured Image Lightbox section. Click on the Additional Options > Unique Post System section. 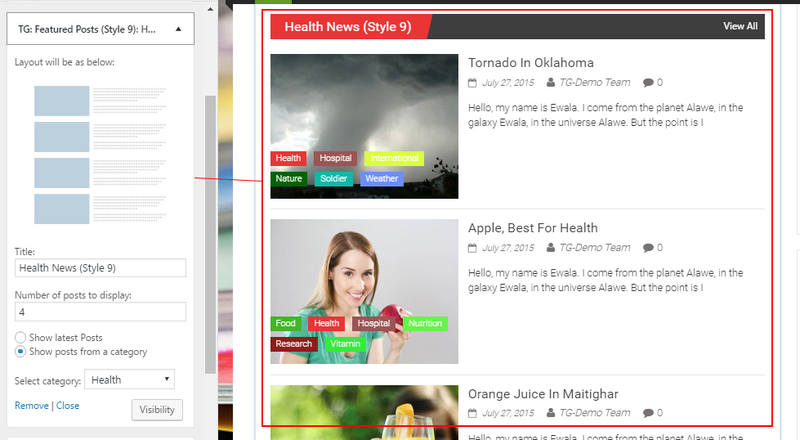 After completing the above steps, click on Save & Publish button to save the changes, and then the already shown post from your site in one widget will be skipped by other widget, bundled within this theme. 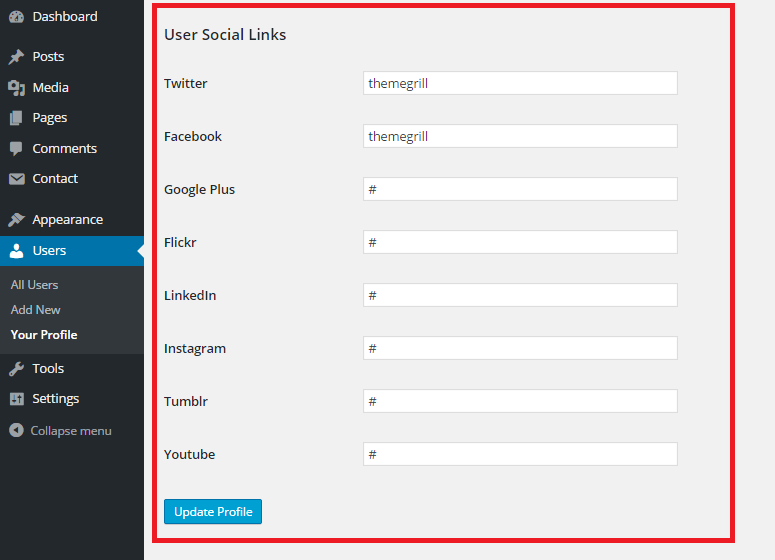 Click on the Additional Options > Social Share Buttons section. Now, you need to fill up the Biographical Info, which is under the About Yourself section. 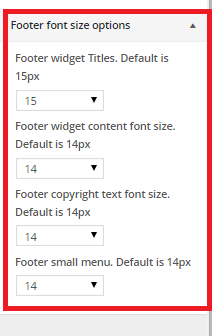 Click on the Additional Options > Footer Copyright Editor section. Now, here, in the textarea for this setting, you can add the info for the footer copyright as your wish. Go to Appearance > Customize > Category Color Options > Category Color Settings section. 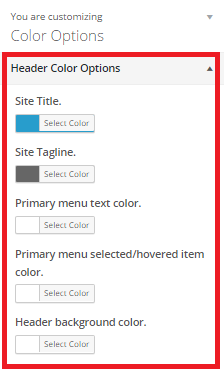 Now, choose the required color as you like for each category present in your site. 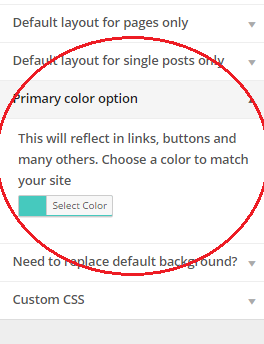 After you have chosen the required color for each of the category used in your site here, you can now click on Save & Publish button to save the changes in your site. As this theme is based on news/magazine layout, so, this theme features almost 16 widgets within it so that your look of the site would become eye catching on the first view. Here, we will describe all of the widgets bundled within this theme. This widget is suitable for displaying the tags in your site. It is best suited for the Right Sidebar area. This widget is suitable for displaying the advertisement in your site via the image and the link added for that image. It is best suited for the Header Sidebar area as well as Advertisement Above The Footer sidebar area. Title: Add the required title for this widget in your site. Advertisement Image Link Add the link url of the required site here to link it to. Advertisement Image Add the url of the image here to display it as the advertisement in your site in the front-end. You can also upload the image via the Upload Image button provided by this widget as its functionality. This widget is suitable for displaying the advertisement in your site via the image and the link added for that image. It is best suited for the Right Sidebar area, Left Sidebar area as well as Contact Page Sidebar sidebar area. This widget is suitable for displaying the advertisement in your site via the image and the link added for that image. It is best suited for the Right Sidebar area, Left Sidebar area as well as Contact Page Sidebar sidebar area. This widget allows you to add upto six 125 x 125 pixels images as the advertisement in your site. Advertisement Image Link 1, Advertisement Image Link 2 and so on counting Add the link url of the required site here to link it to. Advertisement Image 1, Advertisement Image 2 and so on counting Add the url of the image here to display it as the advertisement in your site in the front-end. You can also upload the image via the Upload Image button provided by this widget as its functionality. This widget is suitable for displaying the post of your site in the thumbnail layout, which displays the large featured image of the post at the top side, along with the smaller thumbnail of that post in the bottom side, which reacts as the pager for the above posts. It is best suited for the Front Page: Slider Area Section area. Select category: This option helps you to choose the category from your site to be displayed in the front-end as you like, where ever appropriate while using this widget. Note: For this to work, you need to select the radio option of Show posts from a category. Also, the category which does not have any post associated with it, will not be displayed as the select item via this widget. Note: If you choose the display the post from specific category while using this widget and that category has the color being defined in it via the Customizer Options. This widget is suitable for displaying the post of your site in the horizontal layout, displaying the first post as having the bigger featured images with the post excerpt followed by the smaller one, with the smaller featured image and no post excerpt. It is best suited for the Front Page: Content Top Section area as well as Front Page: Content Bottom Section sidebar area. This widget is suitable for displaying the post of your site in the vertical layout, displaying the first post as having the bigger featured images with the post excerpt followed by the smaller one, with the smaller featured image and no post excerpt. It is best suited for the Front Page: Content Middle Left Section area as well as Front Page: Content Middle Right Section, Right Sidebar, Left Sidebar, Contact Page Sidebar as well as in any of the footer sidebar areas. This widget is suitable for displaying the post of your site in the horizontal layout, displaying the featured images alone with next and previous control button. It is best suited for the Front Page: Content Top Section area as well as Front Page: Content Bottom Section sidebar area. 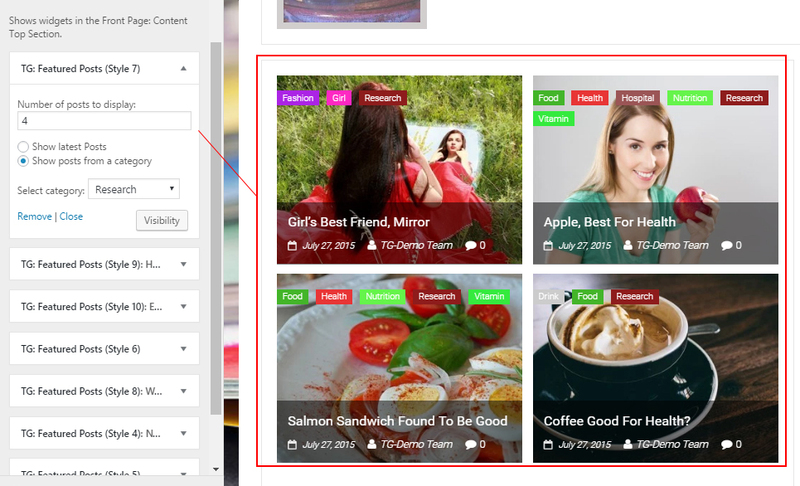 This widget is suitable for displaying the post of your site in the grid or column layout, which displays the featured images of the post along with the title of the post only. It is best suited for the Front Page: Content Top Section area as well as Front Page: Content Bottom Section sidebar areas. Number of random posts to display: Here, add the required number of post to be displayed in the front-end while using this theme. Note:While using this widget and that category has the color being defined in it via the Customizer Options. This widget is suitable for displaying the post of your site in the vertical layout, displaying the smaller featured image and post title. It is best suited for the Right Sidebar area, Left Sidebar area as well as Contact Page Sidebar sidebar area. This widget is suitable for displaying the post of your site in the vertical layout, displaying the smaller featured image and post title. It is best suited for the Front Page: Content Top Section area as well as Front Page: Content Bottom Section sidebar area. This widget is suitable for displaying the post of your site in the thumbnail layout, which displays the large featured image of the post with post title along with controller to slide the full featured image. It is best suited for the Front Page: Content Top Section area as well as Front Page: Content Bottom Section sidebar area. This widget is suitable for displaying the post of your site in the grid or column layout with slide, which displays the featured images of the post follow by same size of featured image along with the post title and category. It is best suited for the Front Page: Content Top Section area as well as Front Page: Content Bottom Section sidebar areas. 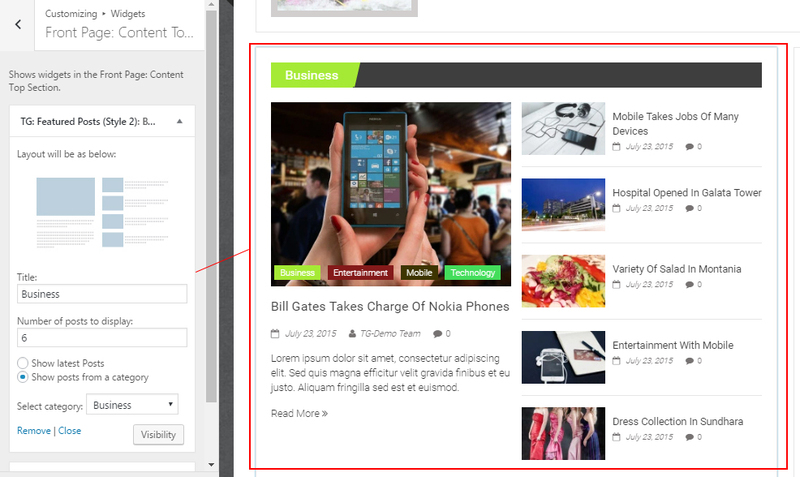 This widget is suitable for displaying the post of your site in the vertical layout displaying the smaller featured image on left and post title and post excerpt on right. It is best suited for the Front Page: Content Top Section area as well as Front Page: Content Bottom Section sidebar areas. Description Here, add the required description of the same widget to be displayed in the front-end while using this theme. Note: If you choose the display the post from specific category while using this widget and that category has the color being defined in it via the Customizer Options, then, the title background of the color of the widget will inherit that color. This widget is suitable for displaying the post of your site in the news ticker layout, which displays the featured image of the post along with its title just below, which moves to the left side always as it is best suited for the ticker layout. It is best suited for the Front Page: Content Top Section area as well as Front Page: Content Bottom Section sidebar areas. Check to display the content in the popup This option in this widget helps you to display the post content of the post in the popup or not according to your site requirement. Also, for this to work, you need to click on the image, not the post title. This widget is suitable for displaying the posts and tabs, especially containing the popular post(displayed via the top comment count on the post from the site), latest post and latest comments. This widget is suitable for the Right Sidebar, Left Sidebar, Contact Page Sidebar as well as all of the footer widgets area bundled within this theme. Check to enable the popular post by view count. Here, this option enables you to display the popular post in this widget via the number of visits of the post in your site, instead the number of comments for that post. This widget is suitable for displaying the videos from the popular website such as YouTube or Vimeo, if you have any, for your site. Since this widget creates the responsive videos for those websites, so, this widget is suitable for any of the sidebar area bundled within this theme. Youtube Video ID: Here, add the required video id of the YouTube video, ie, you need to only add the id of the YouTube video, ie, you can neglect the url upto https://www.youtube.com/watch?v= from the url. Vimeo Video ID: Here, add the required video id of the Vimeo video, ie, you need to only add the id of the Vimeo video, ie, you can neglect the url upto https://vimeo.com/ from the url. Since this theme heavily relies on the post excerpt to display the post content in the front-end, so, if you like to edit those, you can easily do these works as mentioned in below steps. Now, somewhere below the main post editor box, you should be able to see the the Excerpt option box. Since this theme heavily relies on the featured images of the post to be displayed the content of your site uniquely as it is best suited for the news/magazine site. So, we have created different recommended image size for this theme. 1070px * 470px for the TG: Featured Post (Style 1) widget. 345px * 265px for the TG: Featured Post (Style 2), TG: Featured Post (Style 3), TG: Featured Post (Style 7), TG: Featured Post (Style 8) and TG: Featured Post (Style 9) widget. 184px * 109px for the TG: Featured Post (Style 4) and TG: Featured Post (Style 10), widget. 715px * 400px for the TG: Featured Post (Style 6) widget. 215px * 215px for the TG: Random Posts Widgets widget. 115px * 73px for the TG: Popular Posts Widgets, TG: Featured Post (Style 5) widget.